A suspect was killed in an officer-involved shooting in the Skid Row area of downtown Los Angeles, and video shows the deadly confrontation. 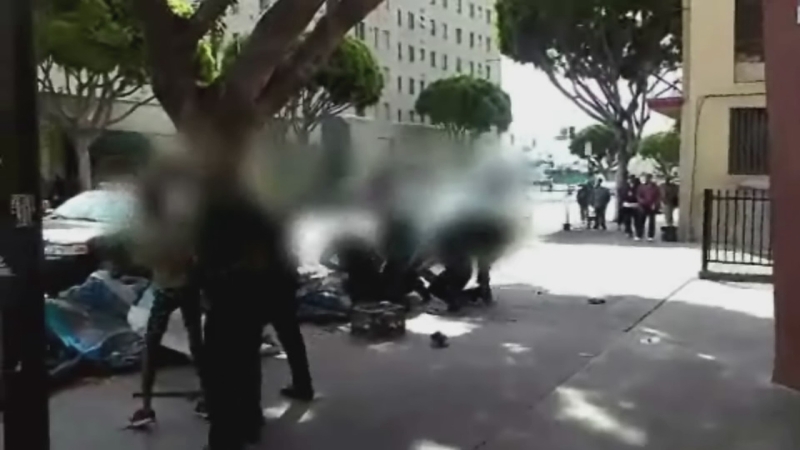 LOS ANGELES, CA -- A suspect was killed in an officer-involved shooting in the Skid Row area of downtown Los Angeles, and video shows the deadly confrontation. Authorities say officers responded to a robbery call around noon Sunday in the 500 block of San Pedro Street. When the officers came in contact with the suspect, an altercation occurred. "The preliminary investigation revealed that during that altercation, at least one less than lethal device, a Taser, was deployed. However, at this time, we still do not know if that Taser did strike the suspect," said LAPD Sgt. Barry Montgomery. Officers continued to struggle with the suspect, and then an officer-involved shooting happened. In the video shot by Anthony Blackburn, someone yells "drop the gun" just before shots were fired. The suspect, who was identified by witnesses as "Africa", was taken to an area hospital, where he was pronounced dead. "Instead of handcuffing the guy, they straight out shot him," said eyewitness Larry Jackson. Yolanda Young said she was in the area visiting a friend when she saw the confrontation near the Union Rescue Mission. "Three cops tased him. He went down to the ground. Next thing I know, he got up, he's swinging on the police," Young said. "They (were) fighting with him, wrestling with him ... They pulled out their guns and they shot him five times." Three officers, one of whom is a sergeant, shot the man as they struggled on the ground for control of one of the police officer's weapons, LAPD Cmdr. Andrew Smith said. "Anytime we have an officer-involved shooting and there's a loss of life, people are upset and justifiably so," Smith said. "Nobody out there, no police officer out there, wants to be involved in a situation like this where you have to take someone else's life." The three officers who opened fire have since been placed on leave pending the outcome of the investigation. People in the crowd were heard on the video saying the man was not armed, but police say they have not yet determined if the suspect was armed. People on Skid Row who knew Africa say he wasn't violent. "What did he do? He wasn't an aggravated person. He wasn't mad all the time. He just had mental problems," said Steven Tugmon. L.A. Urban Policy Roundtable President Earl Ofari Hutchinson and other city civil rights leaders called the L.A. Police Commission to hold a special hearing on the use of force by officers in Skid Row encounters Sunday. "The killing of a homeless man identified as "Africa" underscores the need for the police commission to hold a special hearing to fully examine police tactics and training in the use of deadly force by LAPD officers involving skid row residents many of whom have major mental challenges," said Hutchinson. "The special hearing would be an unprecedented effort by the commission to set a firm protocol and standard LAPD officers use to minimize the use of deadly force in encounters on skid row." Smith said at least one of the officers was also wearing a body camera. A local homeless shelter may have also captured the incident on surveillance video. Police Commission President Steve Soboroff said the independent inspector general and the district attorney had all begun investigating the incident. Anyone who witnessed the incident was urged to call the LAPD.